No. The answer is no. Here’s why. The top of the range make-up artists use high quality, pro-grade products to make you look and feel like a million bucks. Since Kenya is so limited in genuine make-up products, most of us make-up artists source our products from outside the country. There’s usually that brother or friend abroad that you kinda have to bother 4 months in advance, to get you a few make-up products to use on your clients. Or we buy online and have them shipped to Kenya.Not to mention the tax episodes we usually have at the post office…But that’s a story for another day. Many artists are self-taught, some have certificates(Your truly here) and years of experience. That means they know the ins and outs of make up. They know how to colour-correct the dark circles under your eyes because they know about colour theory, they know the best products for mature skin and even know the different kinds of face primers there are out there. They have invested their time and money in educating themselves to stay in the know of current trends, they have gone for workshops and even trained abroad. They know their stuff. They usually surprise you with knowledge on techniques they have mastered which will leave you saying “I didn’t know that!” When you pay a lawyer KSh.20,000 per hour, it’s not like they are doing anything more than making a phone call on your behalf. It’s purely because of what they know, experience and reputation. When you book that budget make-up artist, you may stay up all night wondering if they will show up to do your make-up for your wedding in the morning. I have witnessed this on two different occasions! Poor bride. You asked your cousin Grace to come do your wedding make-up because she was cheaper than an actual make up artist and she didn’t show. Professional make-up artists will show up. We show up. We also know the proper etiquette when working on clients. So you’re paying for that piece of mind that your make-up artist will uphold all professional standards on your already stressful, special day. 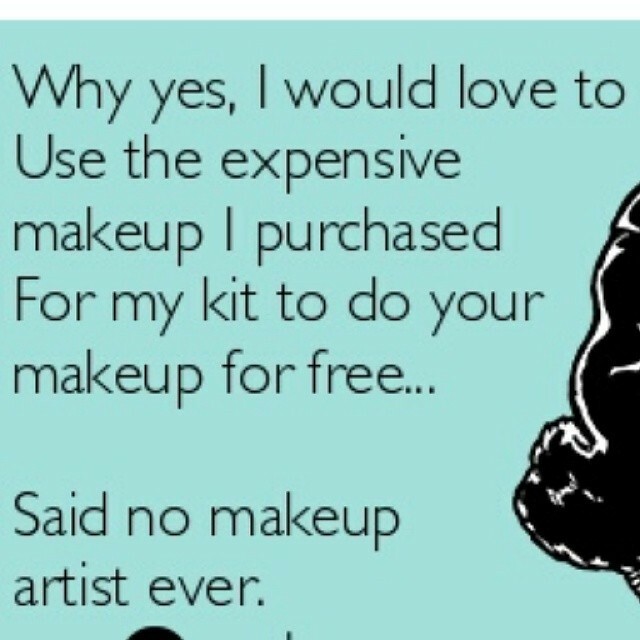 Especially for brides, don’t pinch pennies trying to get a cheap deal for make up some 3 days before your wedding. You spend tens of thousands on flowers that will die, hundreds of thousands on food that will be finished but you want to spend KSh. 1000 on make-up for photos that are eternal? Get an artist at least two months before your wedding. It’s worth it. Make-up artists offer services at their homes, studios or on location. Before I come to you, there’s usually time taken to plan the look, gather the products for the look and organize my well-stocked kit. True make up artists observe the highest standards of hygiene of make-up products and tools. We usually sanitize our products and tools to prevent spread of any infections. Then there’s the emails, texts and phone calls we exchange. Then there’s travelling to the location with our huge kits, which sometimes is an out of town location, 4 hours away. For a client. It’s not just the time we spend doing a client’s make up . It’s also the time before and after that. When a make-up artist sets their rates, you have to understand that they are also a person like you, trying to make a living. This is not just something that they do to take selfies on Instagram. They work on people’s faces in exchange for payment . Payment for work done. Just like anyone in the work force. They have families to feed, rent to pay, insurance cover to pay for, cars to maintain(which they use to travel to you), replenishing products, paying for advertising, taxes, maintaining websites so that you can find them easily…These are the costs that come with being self-employed. So giving out discounts injure us. When you give us a phrase like ” Can you reduce for me the price? I’m just a beginner at make-up…” My darling, that make-up artist is not a beginner at make-up. That is why you are asking for their services. So when I see a make-up artist doing a face for KSh.1000 I wonder how they are able to do all these things because they are selling themselves short. Many times,you have the luxury of not leaving your home to go to the artist to get your make-up done. The make-up artist comes to you. Especially on your wedding day. Can you imagine you and your bridal party of 10 going to a salon to get your make-up done on the morning of your wedding day? Artists will come with their long-wearing products like MAC, Bobbi Brown, Lancome…Their Real Techniques brushes and human hair false lashes…You know….The good stuff… and expertise to give you the pampering of your life. They stand for hours on end, tending to you hand and foot, to make you feel and look like the queen you are! As you know, all luxury items come at a price. They are not overrated. They are worth it. Remember “You get what you pay for” and “Good work is not cheap and cheap work is not good” . This is the perfect way to break down this inofamrtion. Hello Winnie! Am really new to the makeup world. Am not sure of the products i need to use and the colours i require. I'd kindly like to know how much you will charge me to guide me on the shades and products i need to use. Hello! Please email me on info@winniethemakeupartist.com and I will send you a quote. Am sharing this on my instagram story and saving it. Clients really need to know and understand.